1 king bed or 2 twin beds. Balcony. 33 sq. m (355 sq. ft). In-room safe. Cable/satellite TV. Direct-dial phone. Minibar. Complimentary bottled water. Coffee/tea maker. Private bathroom with shower/tub combination. Jetted tub. Handheld shower. Hair dryer. Complimentary toiletries. Air conditioning. Ceiling fan. Daily housekeeping available. One king bed or two double beds. Furnished walk-out balcony with pool, garden, or sea view. Mexican-style decor. Table with chair and desk. Cable TV. Minibar. Complimentary bottled water. Coffee/tea maker. Marble bathroom with tub/shower combination and hair dryer. In-room safe. Air conditioning and window opens. <strong><ul><li>1 king</li><li>2 twin</li></ul></strong>Balcony with <strong>view of the garden</strong>, <strong>pool</strong>, and <strong>sea</strong>. Television with cable channels. <strong>Wireless Internet access (surcharge)</strong>. In-room safe. Minibar. Shower/tub combination with handheld showerhead. Bath amenities include hair dryer and complimentary toiletries. Clock radio and iron/ironing board. Air conditioning and ceiling fan. Wheelchair accessible. 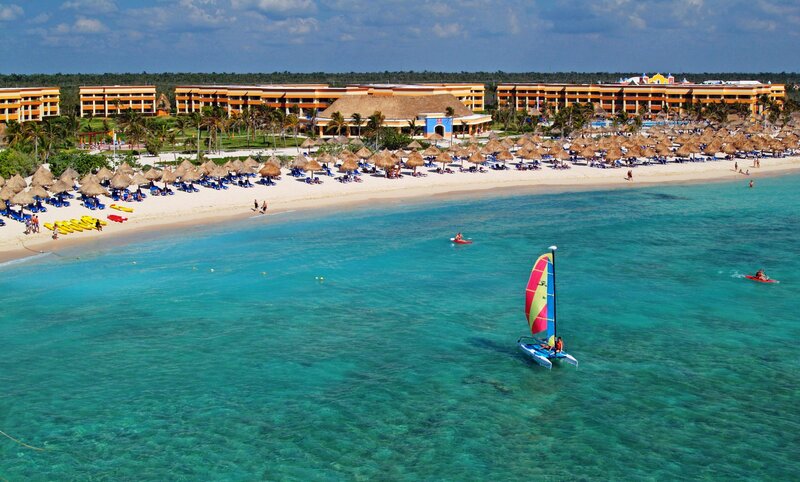 Great service, spacious rooms and a spectacular location are the hallmarks of Grand Bahia Principe Tulum. The all-inclusive resort has multiple family-friendly activities including a water park, an activity pool with organized games and activities, in-room mini-bars, a nearby golf course and evening entertainment. The resort is part of the Grand Bahia complex located just 20 minutes from the ruins of Tulum. A mini-train service at the resort gives you access to all parts of the complex. Choose one of 4 different categories of rooms at Grand Bahia Principe Tulum. All rooms include air conditioning, coffee maker, mini-bar, satellite television, iron, hair dryer, safe and balcony or terrace. Upgrade to a Club Hacienda room and enjoy exclusive services including access to a private pool, a welcome cocktail at a private reception, bathrobes and slippers, and more dining options. Multiple handicap-accessible rooms are available. The four restaurants offer a variety of cuisines and flavors guaranteeing your taste buds will never get tired. The international buffet regularly offers theme nights. Regional dishes are served at the Brazilian and Mexican restaurants. For the daring gourmand, experimental cuisine is served up at “Don Pablo.” And if you have a late-night craving the snack bar is open 24 hours a day. A large number of beach bars, pool bars and other bars throughout the resort serve up mixed drinks, beer, soda and wine. A variety of traditional services and amenities are offered at the spa including massages, facial and body treatments, manicures and pedicures and a beauty salon. For something a little more unique try a mud massage, a chocolate scrub or give the hydrotherapy water circuit a try. Kids ages 4-12 can stop by the Bahia Scouts miniclub to play or make new friends, or the whole family can visit the Bahia Scouts Waterpark located at Gran Bahia Principe Coba. Enjoy free greens fees at the nearby Riviera Maya Golf Club, an 18-hole challenging course that winds through spectacular scenery including lakes and the jungle and is designed for pros and amateurs alike. Wedding, anniversary and vow renewal services and packages are available. The Grand Bahia resort complex offers a variety of rooms and amenities to host groups and conventions of all sizes.